The tour to Tragedy Creek is the beginning of longer tours in the Shot Rock area. 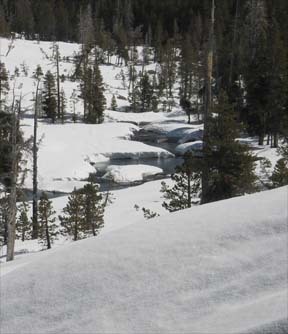 Although intermediate and more advanced skiers will likely opt for one of the longer tours, the tour to the creek is a way for beginner-intermediate skiers to get a glimpse of this astounding area. The most beautiful time to visit Tragedy Creek is in the spring when parts of it are open and you can see water flowing over granite slabs. 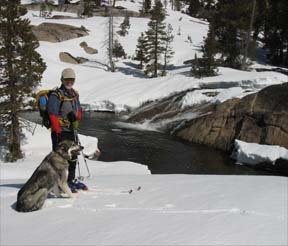 Once at the creek you can explore it and the nearby slopes. Be aware that the tour to the creek is downhill so the return is uphill. Also be aware that this tour is steeper than most tours rated beginner-intermediate. It has been so rated because the tour is very short and the descent is on an open slope that provides excellent opportunities to zigzag down if necessary. Finally a word of caution. In the spring take extra care when crossing Tragedy Creek. As mentioned earlier, two longer tours in the Shot Rock area are described in this guide. They are the Shot Rock Loop tour and the Shot Rock to Bear River tour. Continue southeast, passing between two larger knobs, for 0.3 mile until you reach Tragedy Creek (4). Retrace the route for 1.0 mile back to the trailhead (1).